A video of Syrian boy Omran Daqneesh sitting silently in an ambulance after being rescued from his bombed-out home has gone viral over the internet, prompting the Church to urge Christians to help protect children in war-stricken areas. Five-year-old Omran and his family members were pulled alive from the rubble of his devastated home in Aleppo, Syria after an airstrike on Wednesday. While all of them survived the bombing, the Syrian boy who sat without crying while his face was covered in blood quickly became a symbol of the effects of war in Syria, CNN reports. 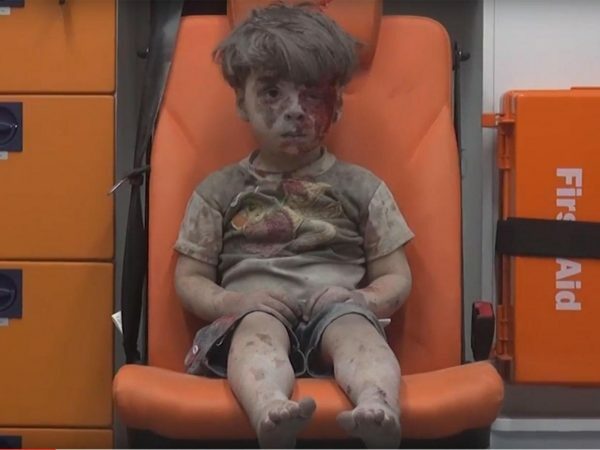 In the video, Omran is seen looking dazed while sitting inside the ambulance. He raises his hand to his left temple area before wiping his face and looking down at the blood on his hand. What was striking in the clip was the fact that the boy did not cry at all despite the chaos all around him and his situation. “He was in extreme shock,” a spokesman from activist group Aleppo Media Center (AMC), which posted the viral video, described the boy. While Omran’s whole family miraculously survived the recent airstrike, thousands of people including 4,500 children have died in the violence that has gripped Aleppo for years. “The truth is that the image you see today is repeated every day in Aleppo,” AMC cameraman Mustafa al Sarouq, who filmed the video, told CNN’s Nima Elbagir on Skype. The United Nations (UN) has called for a halt in the violence in Aleppo as the fighting in the country escalates. UN envoy Staffan de Mistura told the media in Geneva that none of their aid convoys reached any of their target areas in a month because of the violence. Meanwhile, the Holy See has urged the UN and local governments to do something to protect the children in besieged areas all over the world. Archbishop Bernardito, the Apostolic Nuncio and Permanent Observer of the Holy See, released a statement saying the crimes against children should be “condemned in the strongest possible terms,” Catholic News Agency relays. In addition, the archbishop said something must be done to help the children reintegrate back into their communities. Vatican hopes that the situation of Omran Daqneesh and the other children caught in the conflict will inspire people to stop the violence and initiate dialog.